August is here! 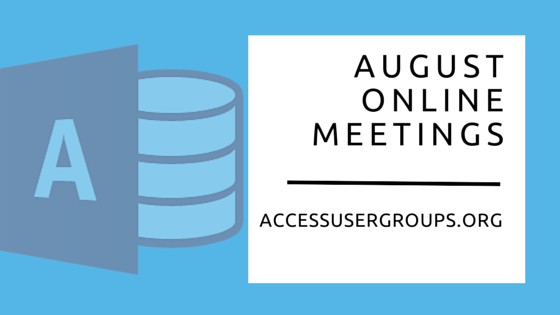 Summer is winding down, but we still have some great MS Access User Group webinars. We’re also happy to announce that we’re launching a new chapter – the Canada Access User Group. If you haven’t attended one of our webinars before, they are free webinars open to the public – from novice to professional developers – to learn from our live MS Access tutorials. At the end of the webinar, there will be time for a Q&A session and attendants will receive a link to the video recording of the webinar for future reference. We meet every 1st and 3rd Tuesdays of every month, from 4:00 pm – 4:45 pm ET for a Q&A session. These are open forum meetings where we can discuss any topic suggested during the meeting. When it’s time, join the meeting from here. Don’t miss out on this special session. If you’re an Access developer with multiple users, you are probably aware that best practice in the field is to use a split database architecture with a shared backend file (or SQL server) and distributed copies of the frontend. Now without help from some software, it can quickly become a pain to maintain all those frontends, and make sure everyone is up to date. On August 5th @ 21:00 Central European Time, I will demonstrate both the custom Access Application (OF COURSE I WROTE IT IN ACCESS) that ensures everyone is using the correct version, as well as the tool I wrote for myself that: backs up the latest dev version, decompiles it, compacts it, compiles it to a accde file, places it on the server, handles patch notes, and informs the update application that an update is ready. It’s literally that easy, and probably saves me 20 minutes per deployment of update. I love it, and I am going to share it all with you. DOWNLOAD LINKS WILL ONLY BE PROVIDED TO THOSE PRESENT AT SESSION! We meet every first Wednesday of the month at 9:00 pm CET. When it’s time, start the meeting from here. We meet every third Tuesday of the month at 7:00 pm ET. Nuestra reunión será usando este enlace. Launching Next Month – Access Canada!